Piece for 'The One Page Comic Show' where artists were asked to tell a story in one page. I was intrigued by this, since I grew up reading Japanese manga, and once dreamed of becoming a manga artist. Though it was definitely challenging I enjoyed it. 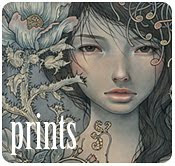 This group show will be held at Roq La Rue Gallery in Seattle. 3/27-3/30 during Emerald City Comic Con.